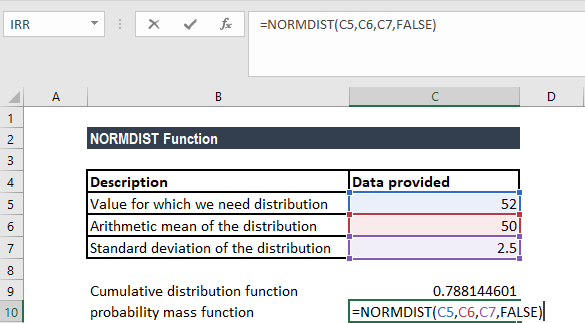 What is the NORMDIST Excel Normal Distribution? The NORMDIST Excel function is categorized under Statistical functionsFunctionsList of the most important Excel functions for financial analysts. This cheat sheet covers 100s of functions that are critical to know as an Excel analyst and will return the normal distribution for a stated mean and standard distribution. That is, it will calculate the normal probability density function or the cumulative normal distribution function for a given set of parameters. To understand what a normal distribution is, let us consider an example. Suppose we take an average 30 minutes to commute to the office daily, with a standard deviation of 5 minutes. Assuming a normal distribution for the time it takes to go to work, we can calculate the percentage of time for which the commuting time would be between 25 minutes and 35 minutes. As a financial analystFinancial Analyst Job DescriptionSee a real Financial Analyst Job Description including all the skills, experience, and education required to be the successful candidate for the job. Perform financial forecasting, reporting, and operational metrics tracking, analyze financial data, create financial models, the NORMDIST function is useful in stock market analysis. While investing, we need to balance between risk and returnRisk and ReturnIn investing, risk and return are highly correlated. Increased potential returns on investment usually go hand-in-hand with increased risk. Different types of risks include project-specific risk, industry-specific risk, competitive risk, international risk, and market risk. and aim for the highest possible return. Normal distribution helps quantify the amount of return and risk by the mean for return and standard deviation for risk. X (required argument) – It the value for which we wish to calculate the distribution. Mean (required argument) – It is the arithmetic mean of the distribution. Cumulative (required argument) – It is a logical value. It specifies the type of distribution to be used: TRUE (Cumulative Normal Distribution Function) and FALSE (Normal Probability Density Function). 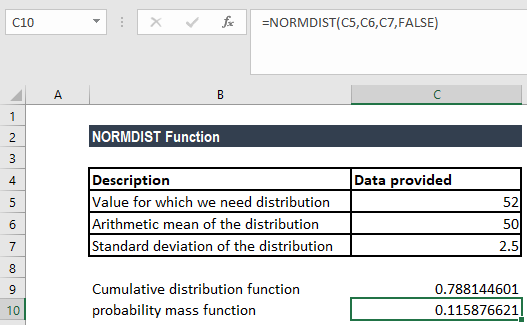 How to use the NORMDIST Function in Excel? 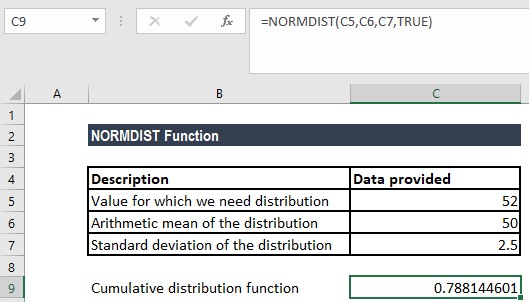 The NORMDIST function was replaced by NORM.DIST function in Excel 2010. NORM.DIST provides more accuracy than the NORMDIST function. 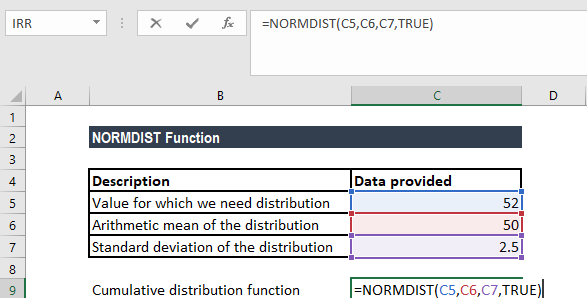 The NORMDIST function is still available in Excel 2010 version. However, it is stored in the list of compatibility functions to allow compatibility with earlier versions of Excel. The NORM.DIST function refers to any normal distribution, whereas the NORMSDIST compatibility function and the NORM.S.DIST function refers specifically to the unit normal distribution. #NUM! error – Occurs if the given standard_dev argument is less than or equal to zero. #VALUE! error – Occurs when any of the given argument is non-numeric or is a non-logical value.